Oblique aerial view centred on the remains of the dun, taken from the NE. 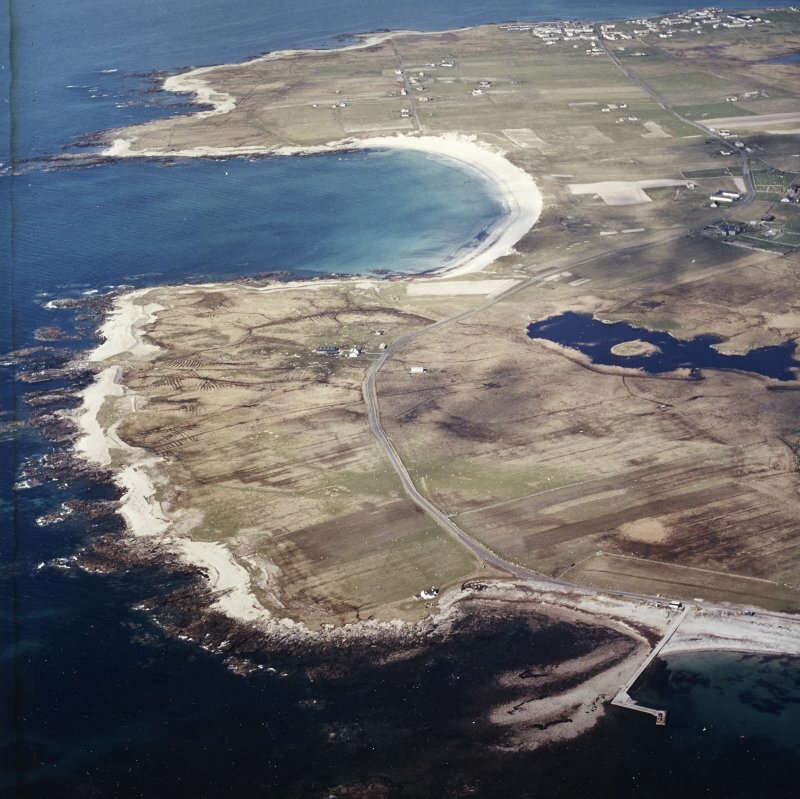 General oblique aerial view looking across the jetty towards the township of Balvanich and the crofting township of Aird, with the remains of the dun adjacent, taken from the SSW. 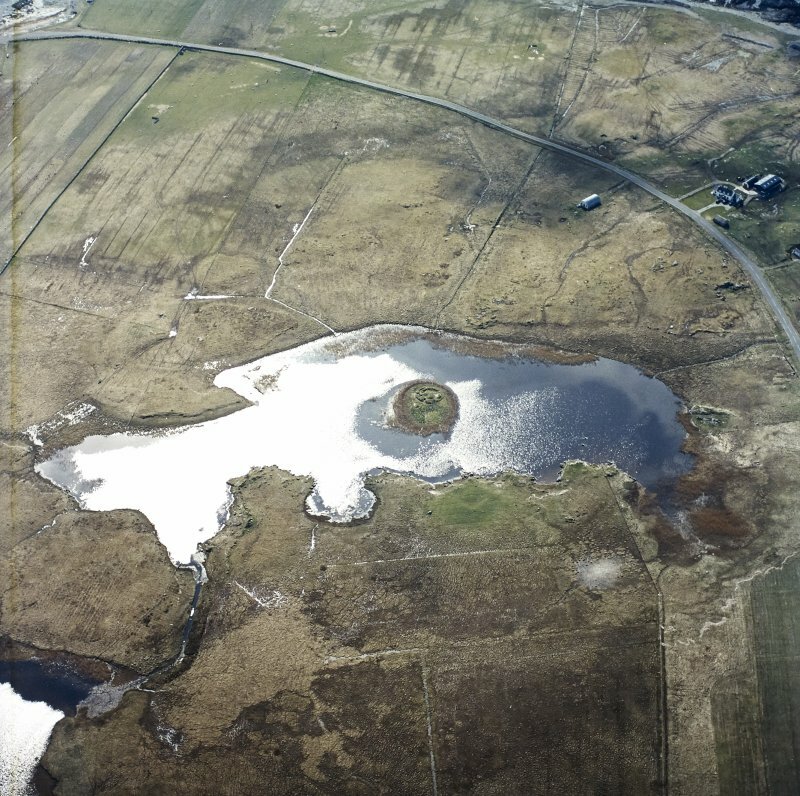 Oblique aerial view centred on the remains of the dun, taken from the NNE. Oblique aerial view centred on the remains of the dun, with the farmhouse adjacent, taken from the WSW. 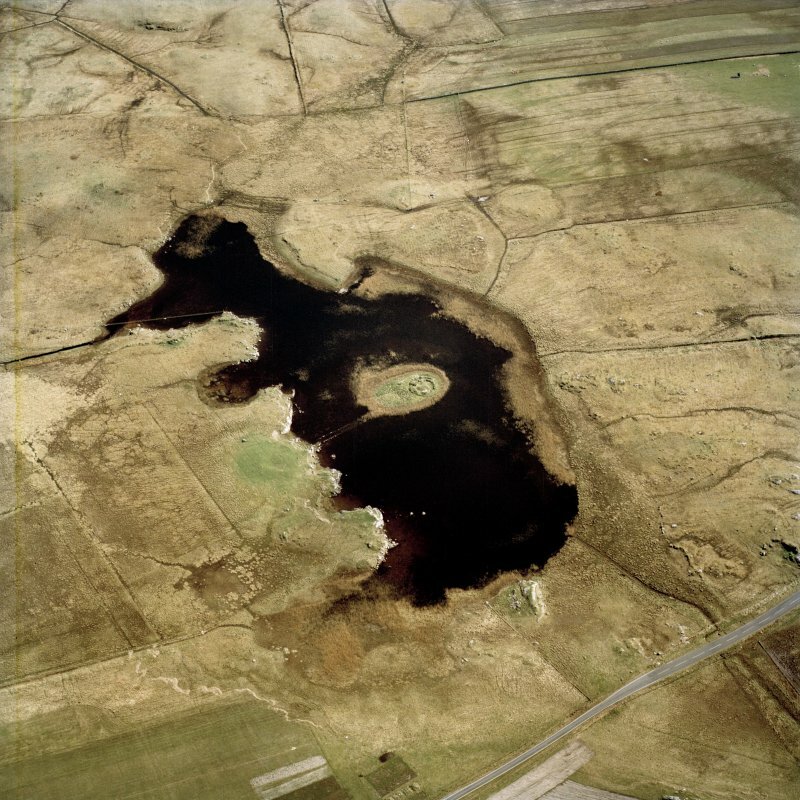 Oblique aerial view centred on the remains of the dun, taken from the WNW. 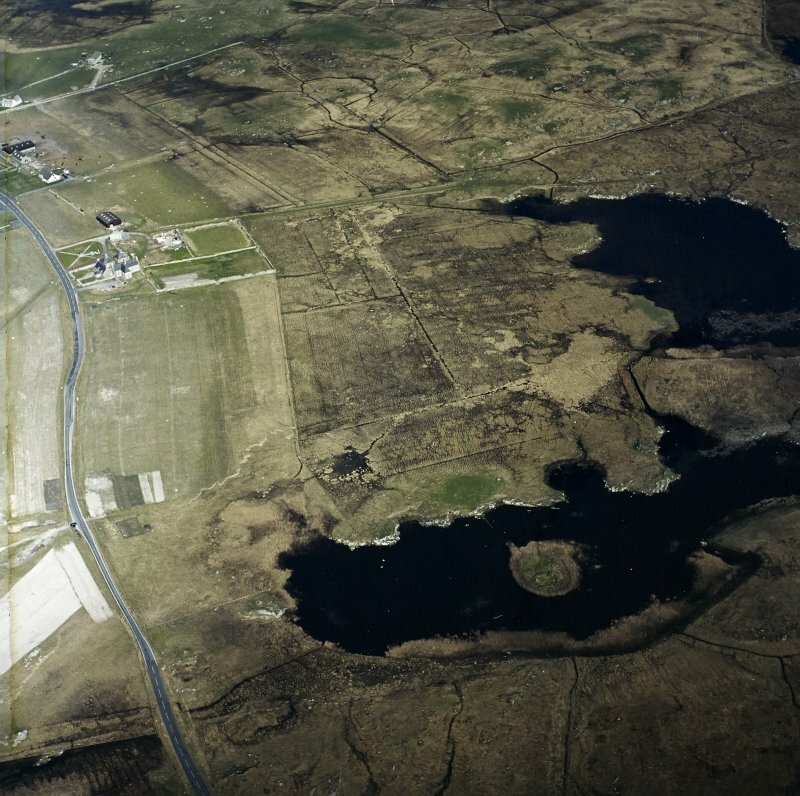 Oblique aerial view centred on the jetty, with the remains of the dun adjacent, taken from the SW.
(NF 7618 5313) Dun Torcusay, which has been robbed of stone to build houses 300 yards north-east at Nunton, is situated on an islet in Loch Torcusay, Benbecula. Only the foundations remain of an irregular oval building which is 40ft north-south and 32ft across internally. The ends of an entrance on the south overlap to face west. There is another entrance at the north-east, to the south of which is a possible chamber 17ft long north-south by 5 1/2ft wide. Dun Torcusay is a galleried dun. The entrance is 1.2m wide and is checked for a door. Immediately to the S of the entrance, is a large rectangular chamber; and further round the wall in the north and south are two other smaller chambers. The walls, which are constructed of roughly faced stones, are 1.1m high. 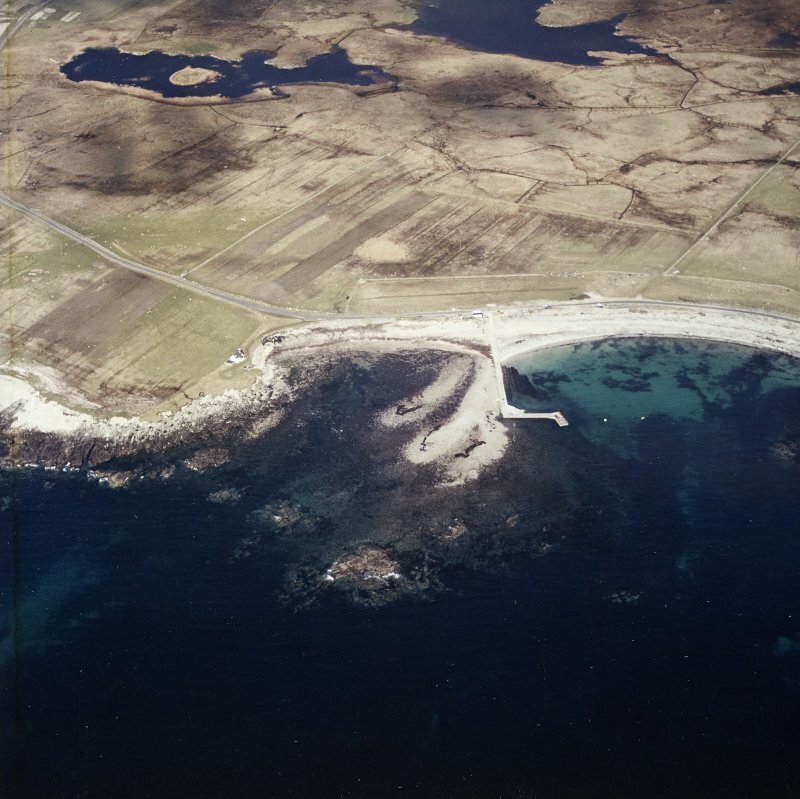 There is no trace of the overlapping entrance in the south mentioned by RCAHMS. Visited by OS (R D) 18 May 1965. 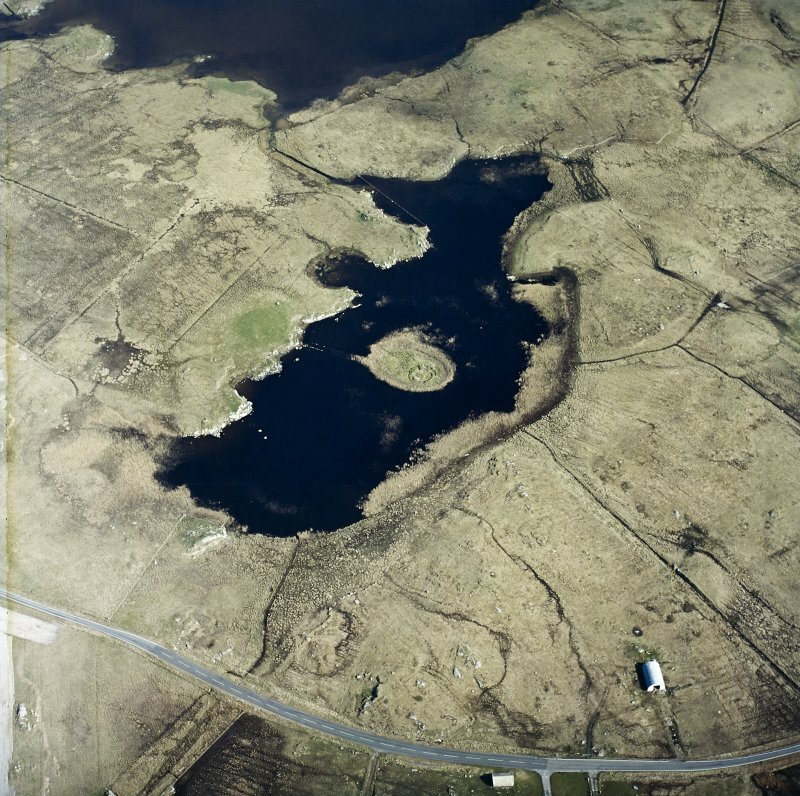 This probable oval ground-galler-ied or transitional broch (or 'galleried dun') in Benbecula stands on an islet in Loch Torcusay and has been robbed of stones to build nearby houses . The plan of the building seems to be an irregular oval and the wall stands 1.1m high in places but only the foundations remain. The entrance is visible on the east and its door-checks are visible. Immediately to the south of the passage is a large rectangular chamber with traces of two smaller chambers in other parts of the wall. In 1965  no trace was seen of the “second entrance” in the south reported earlier . Sources: 1. NMRS site no. NF 75 SE 5 (with plan): 2. RCAHMS 1928, 101, no. 347.